One of my most used tools is my power miter. Most of my projects require the use of this tool especially for cutting 2×4’s, trim, etc. The problem with a power miter is that they do not come with a stand like a table saw. When I use it outside I can often put it on my deck and stand on the ground which allows me to use it in a less awkward position. Other times it is on my drive or garage floor and I attempt to use it on my knees. Another problem is if you are cutting longer boards you need to stack a couple 2×4’s to provide a support to keep the wood level. While looking at a Handyman’s magazine a couple weeks ago I found a solution to my problem. 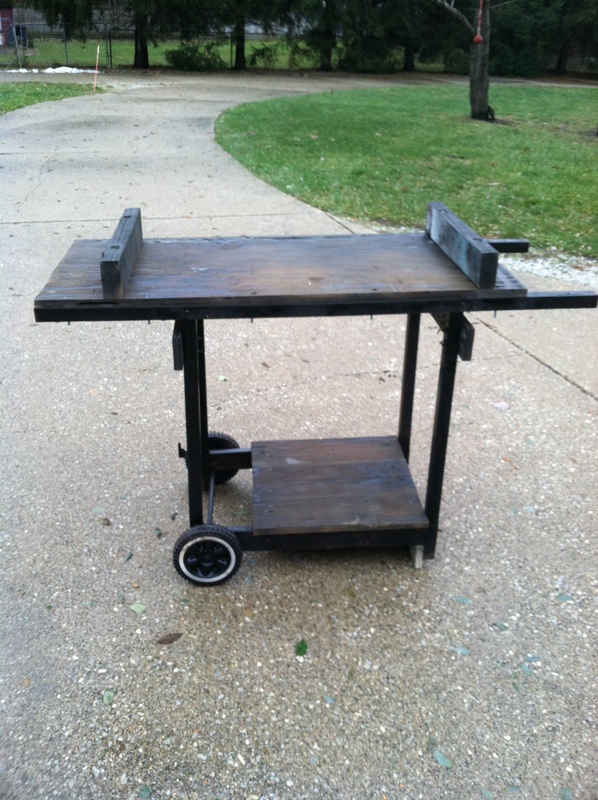 I had an old gas grill at my cabin and decided I could use that for my portable work table. The following is the procedure I used for the conversion. This is the grill before work started. 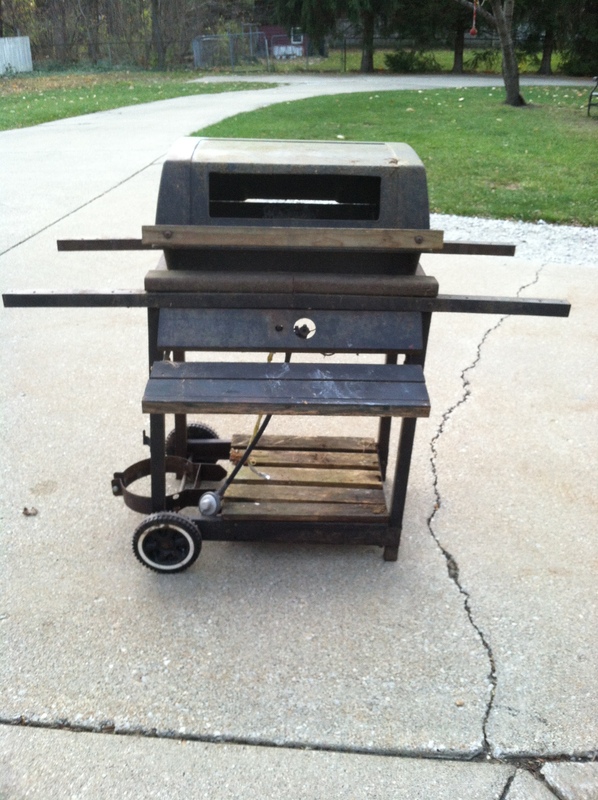 Remove the grill, the control mechanism and the propane holder. 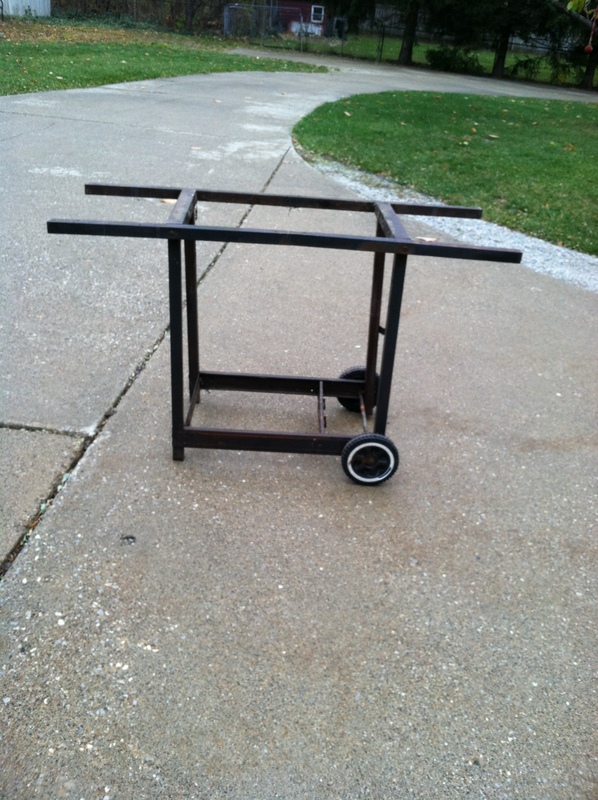 This is the frame work after stripping off the grill. This is the table without the saw. For the table I used a piece of ¾ “ plywood and cut it to fit the frame of the grill depth wise and also cut it length wise leaving myself enough space on the one end for handholds. I drilled though the plywood and the frame and then attached it using machine screws and nuts. The holes may also be counter sunk to allow for a smooth surface. Also for added strength I attached a brace on each end. On the bottom of the grill I made a small platform where I could place the saw when not in use or place some other tools. Next I spray painted the unit just for looks. The supports are made from 2×4’s cut to the height of the table. In order to hold the supports in place I drilled through them and the table top and also counter sunk the holes so I could use 5” bolts that would just drop through the holes and provide a smooth top surface. By using the longer bolts it prevents the support from falling over without having to use nuts to hold them in place. This is the finished product. No more bending over, looking for 2×4’s to match table height or sore knees from working on the garage floor. The only expenditures I had to make were for a can of spray paint, some machine screws and some 5” bolts which all came to around $6.00. 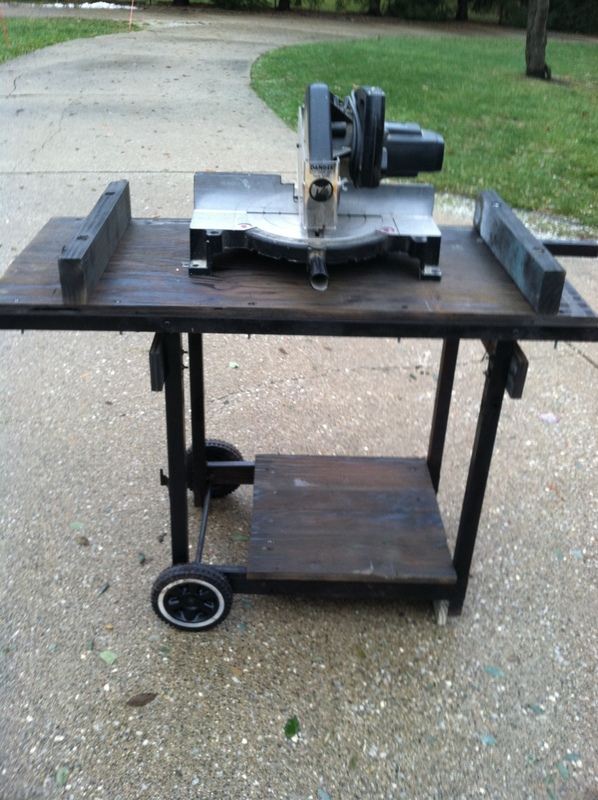 This entry was posted in handyman and tagged crafty, creative, DIY, furniture making, Handyman magazine, miter saw, repurposing, upcycling, wood working. Bookmark the permalink.